Click on image to visit Pac-Man page. Finally, I have a few moments to give my site a much needed update. As some of you may know, work has kept me busy. So busy in fact that I'm having a hard time keeping the site up to date. But rest assured, nothing will stop me from being active in this wonderful hobby. My collection is once again bursting at the seams and quite a few newcomers have entered the cave. I managed to find time this weekend to update the site with 3 new pages. I still have a couple more in the works and will hopefully have those up before the year's end. For now enjoy the new pages. More are coming as time permits. The My Games page has also been updated. And if I don't get a chance to update before Christmas, I hope you & yours have a merry one. Click here to visit the new Pac-Man page. Click here to visit the new Asteroids page. Click here to visit the new Pleiades page. Since I haven't had much time to update my site, I thought I would just inform everyone with a quick rundown of what's been happening since my last update a few months ago. Since that time, quite a few games have come and gone and my collection is once again bursting at the seams. The picture on the left shows just a couple of my recent pickups, a Pleiades and a Sega Turbo. I bought these along with a Sprint 2 from a buddy of mine who is getting out of video games. Originally I was just going to keep the Pleiades. Turbo was a game that I actually sold him years ago, so it's making a comeback and I have since decided to keep it as well. The Sprint 2 was broken and I have since fixed it, somewhat, but as of right now I have no plans to keep it. Now let's rewind some more. After driving to KC to pick up the Asteroids, I made another Kansas City road trip less than a month later to pick up 2 more games. Actually 3, but one fell thru. This time around it was a Tetris and a Rush the Rock for $300 total. 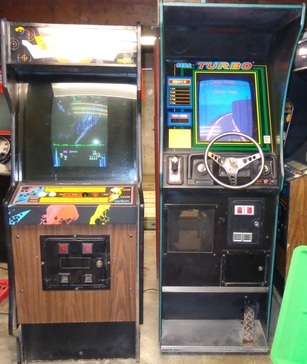 As you may remember, I previously owned a Rush (click here to see that one) which I sold to Jeremy (The Basement Arcade) to make room for the RoadBlasters cockpit project. Well This one is turning into quite the project itself. I am currently working on this one to keep in my collection. I sold the Tetris to Slackers. The game that I was supposed to get but fell thru was a $200 Road Burners that the seller changed his mind on. Needless to say I was pretty ticked when I saw it relisted on CL once again shortly after I was supposed to buy it. Oh well. Can't win 'em all. Since then I also picked up a Sega Columns (this one was local), repaired it and again sold that one to Slackers as well. They also bought the Championship Sprint that I picked up during Easter. And since I ended up taking home a nice Pac-Man with that Championship Sprint, I decided to let Slackers take my Ms. Pac-Man as well. So I added Pac-Man to my lineup and gave it some cool features as well. Stay tuned for updates on that game. I'm sure there's a few more things that I failed to mention but that's the meat and potatoes of the last few months. I did get around to finishing the Video Pinball page which includes a pretty elaborate story, photos and a video. Click here to see that page. More updates to come as I find time. Thanks for being patient. Yes I know, it has been a long time since I've been able to update my site with the latest news or even update on news from the past year. My apologies. Work has kept me very busy. But my philosophy is simple. More work, more income, more games. And I still find time to bring home the bargains even if they are a few hours away. I'm no stranger to road trips, especially when they net cheap space shooters in the Kansas City area. Space Zap & Challenger were both cheap K.C. Craigslist finds that I was proud to claim. This time around, I found Asteroids. Upon talking to the seller on the phone, I had learned that he had the game in his home for about 25 years, most of it's life. I began to wonder if this game had ever seen an arcade. Anyway, he informed me that the game was all original and in good condition, but had a resetting issue. His asking price was $250 which would have been more than reasonable for a working example. However when they need work, I have to break the news to the seller that I can't go near his asking price. Typically I offer next to nothing for broken games, especially now that I have so many of them. Yeah, I'm spoiled at this stage of collecting. In this case, I know it's a complete classic in good condition so I decided to go for it. I offered $150 in cash and told him I would hurry on over if he accepted, which he did. Another road trip in the books. So what could be wrong with this game, and has it really spent no time in a commercial environment? Stay tuned for updates. They are coming, I promise. Just be patient. More updates to come on my last couple of hauls as well. "He has risen! Hallelujia!"... and so have more great CL bargains. While visiting the Wife's family in the KC area for the Easter holiday, I scanned CL as I usually do for cheap arcade games. Slim pickings this time around, but I did come across a Championship Sprint. 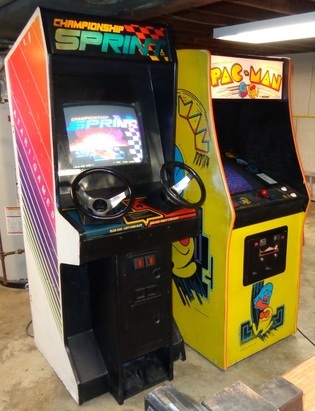 The listing was a few weeks old and claimed that the game was working except for one steering wheel and some discolorization on one corner of the monitor. The seller had it listed originally at $200. Now I was pretty sure he was going to reject a lowball $50 offer but it never hurts to mention it. He countered at a mere $60 and I accepted. Something was telling me this would be an easy fix & flip game. Upon arrival the first thing I acually spied in this young man's garage was a pretty nice Pac-Man game sitting along side the Championship Sprint I had agreed to purchase. 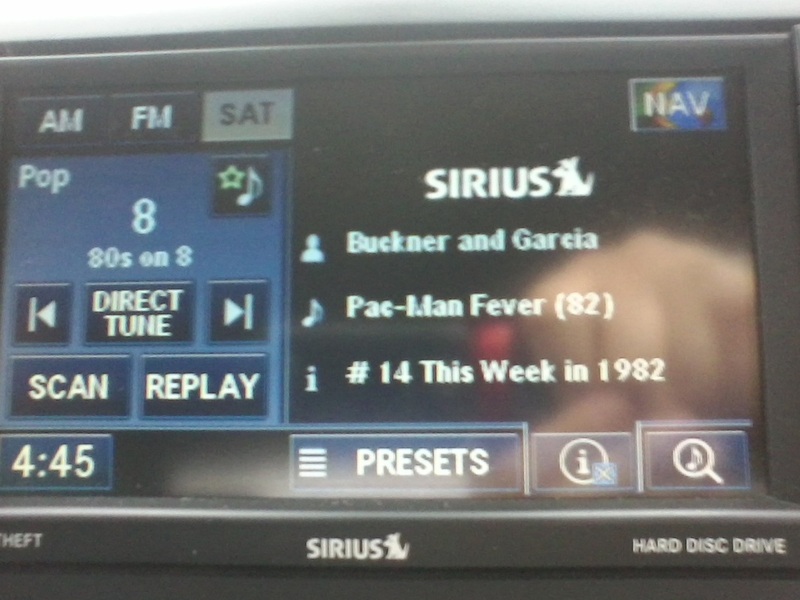 I couldn't resist asking about Pac-Man. Apparently he had picked up both of these games as projects. Pac-Man was booting to garbage on the screen and he had lost interest after he just picked up a new set of wheels. Do my senses detect another potential bargain? I asked if he wanted to sell it. He said "sure", but wasn't sure what kind of price he wanted. From there I explained that I already owned a Ms. Pac-Man and would be interested at $100. Although I did assure him he could probably get more out of it with a little research, he agreed to let it go. His mother was also in this conversation and I think she just wanted the space back in her garage. Needless to say I broke out the checkbook in a hurry on this one. I paid, I loaded and I'm bringing home two more projects. Seem's I just can't get away from these things. Appropriate song playing on the radio heading home. So what are my plans for these guys? Stay tuned. More update's to come on the January pickup as well. Click image to visit "The Video Craze" Kickstarter page. 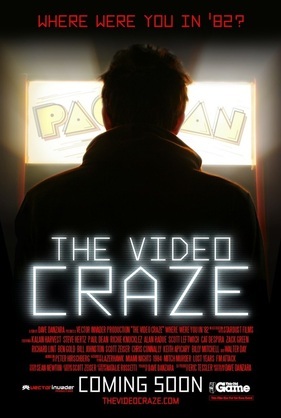 "The Video Craze" is an upcoming documentary film which is directed & produced by Dave Danzara (aka Vector Invader). 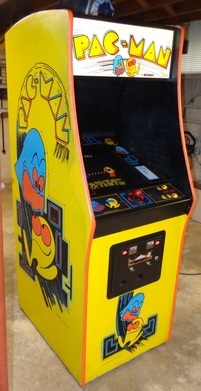 It explores the classic arcade games we know and love, the memories of 30 years ago as well as the passion of collectors (like myself) who strive to find arcade games and bring them back to life. As you can tell from the official trailer (shown below), the production values are great and Dave is truly passionate about making this film a reality. With that said, he has started a kickstarter in hopes to raise enough funds to give this documentary a proper release. If you would love to see this film come to light, then join me by donating to the kickstarter fund. You can pledge any amount you like, however there are incentives you can cash in on for pledging specific amounts. More information can be obtained by clicking here. You can also click here to visit the official site for "The Video Craze". You never know, maybe I'll even appear in this film. Just after Christmas, imagine an ordinary day. After a full day of work, I come home, relax for a bit and check my email. To my surprise I receive a new contact form. 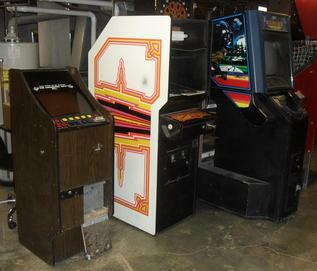 A fellow from Jefferson City had 3 games in his basement that he needed cleared out for a remodel. Typically most of my scores come from craigslist. However in this case he never listed these, nor did I put up a wanted post. It was this website that led us to communication. He send me photos, explains what he has and negotiations take place. The games consisted of a mostly working Cal-Omega poker machine, a dead Video Pinball and a dead Return of the Jedi. I really didn't need to buy more games, but there were some treasures here and this fellow was motivated to sell. So I offered $100 cash and I'm off and running to claim these games. Obviously for the price I paid, these were all project games. But they were mostly complete and could be resurrected in the right hands. I passed 2 of these games on to a fellow forum member. But there's one in particular that I decided to keep for myself. I will be bringing this one back to life and squeezing it in to the lineup. Can you guess which game is the keeper? Stay tuned. Click here to visit 2012 Archives.